The study of invasive plants and animals has started to pay attention to cities. In a paper just out, written by my colleague Joëlle Salomon Cavin and me, we document this ‘urban turn’ and ask what its implications are. Specifically, our paper does a few things. We review how the ecological sciences in general have long had blinders as far as matters urban go, but also the existence of alternative paradigms – notably in 20th century European circles and in diverse ‘urban ecology’ traditions. Then, we look in more detail at how invasion biology has dealt with (or ignored) cities. 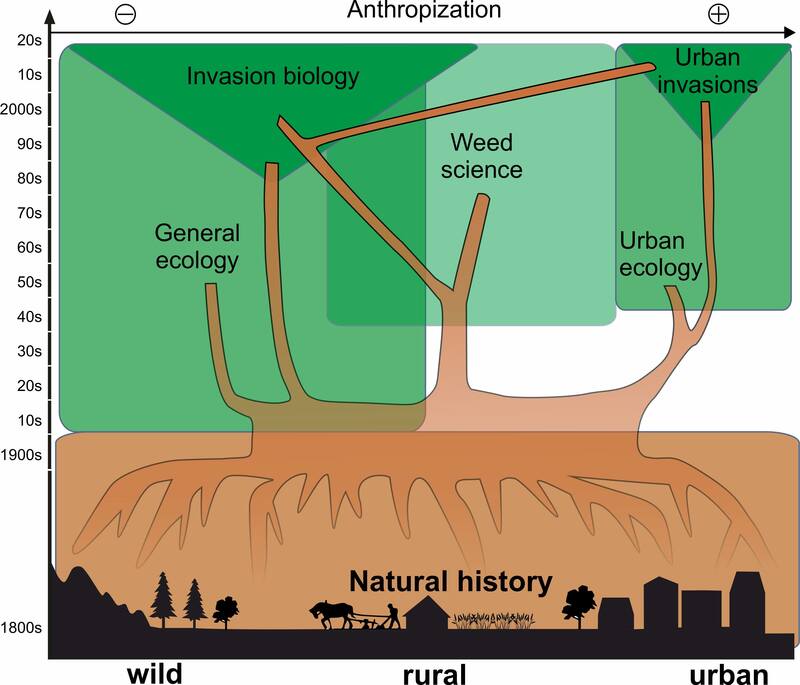 In doing so, we trace the history of ideas and disciplines behind urban invasions (summarised in this nifty figure here), and we review a variety of representative texts in the field of invasion biology to see how cities, urbanity, and urban processes feature in them (not that much, really). We point out that the incipient literature in urban invasions carries three dominant framings, or discourses, of “the urban”. There is the discourse of “cities as problems” which serve as points of entry, establishment, and multiplication for invasive species. There is the discourse of “cities as victims”, which highlight the negative impacts of invasive species on the economy, public health, security, property values, culture, and environments of cities. Finally, there is the discoures of “cities as actors and solutions”, that highlights the roles of cities and their concentration of people, power, institutions, budgets, and ideas as key actors in thinking about and acting on urban invasion problems. The first discourse is the most common; the second and the third are more recent, illustrating a transition within ecological points of view to a less negative or disdainful image of cities. Finally, we consider how paying attention to invasions in “urban nature” challenges fundamental concepts about the city vs. nature, human vs. wild dichotomies. An urban turn in invasion biology makes much more obvious the discordance inherent in visions of pure nature. If one moves to protecting urban areas and their anthropogenic natures from invasives, then there are consequences for some of the central concepts in invasion science. First, the distinction between native and alien no longer helps to distinguish between what must be protected and what must be avoided, as built-up and settled areas are rarely ‘natural’ and ‘native’. Second, a focus on urban invasions forces analysts to broaden their gaze from the narrow impacts of invaders on the functioning or diversity of an intact native ecosystem, to broader impacts on urban infrastructures, human populations, culture, economy, and novel urban ecosystems, as well as on the questions of who gains, who loses, and who decides which impacts are more important. Third, a focus on urban invasions emphasizes the human role in invasions, implicitly blaming the plant or animal species deemed ‘invasive’. In sum, the urban turn necessitates more explicit and direct attention to human roles and judgements. To learn more, I encourage you to read our paper. It is part of a special issue called “Urban invasions” in the journal Biological Invasions that aims to be the reference collection for this new field of investigation. (Articles for the special issue are starting to appear in the ‘online first’ section of this journal and will eventually appear in a bespoke issue). This entry was posted on Friday, November 10th, 2017 at 11:24 am and is filed under Interdisciplinarity, Introduced and Invasive Plants, Research. You can follow any responses to this entry through the RSS 2.0 feed. You can leave a response, or trackback from your own site.